The surprise at the end of Split excited some filmgoers while making others shrug. Is it really a big deal? On one hand, a few readers thought I should have mentioned what the reveal was (since it was teased in the headline). That’s probably fair, since those who saw the movie probably wanted to read and discuss it, and I chose to avoid it because of spoilers. But I felt like the surprise had little to do with the overall movie, so wasn’t really worth mentioning. Additionally, I wasn’t certain how many people would even care after watching the scene in question. Others thought me calling the final scene a “big reveal” was a significant exaggeration. That’s kind of where I came down on it, watching most of the audience I viewed the movie with unfazed by that surprise. By using phrases like “big reveal” and “twist,” I got caught up in the wave of excitement many film writers have been expressing since seeing Split. But most regular filmgoers didn’t seem too moved by that final scene. Several friends have even asked me what it’s all about. That makes total sense, because it was a self-gratifying gesture by Shyamalan. (One friend called it “masturbatory.”) And if you’re not a fan of the director’s entire filmography or just don’t remember a movie that came out more than 16 years ago, how could the surprise have any resonance or meaning for you? Yet if you’ve been a fan of Shyamalan’s work — and particularly his 2000 film Unbreakable — then that final scene likely felt special to you. 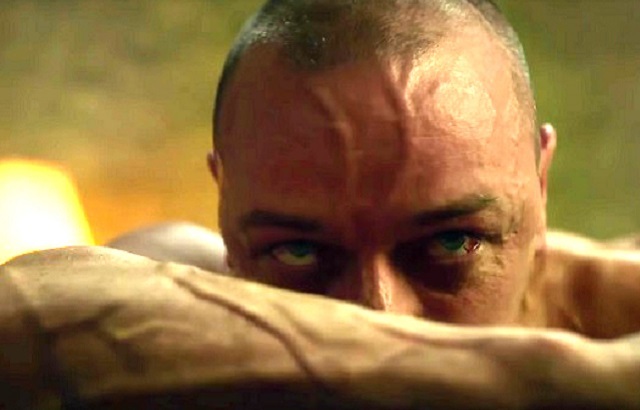 After Kevin Crumb (James McAvoy) has finally tapped into his 24th and most powerful personality, which his other personalities refer to as “The Beast,” he gets away from police and is on the run despite being shot twice by Casey, the woman he’s kidnapped (Anya Taylor-Joy). That alone left room for a sequel if Shyamalan ever wanted to revisit the character, though he’s never made a sequel to any of his previous films. But then after a cut to the title card, the movie goes to a final scene that takes place in a Philadelphia diner. On the TV is a news report about Crumb being at-large and getting the nickname “The Horde,” referring to his multiple personalities. As the camera moves down the counter, a woman says that this case reminds her of something that happened 15 years ago involving a man in a wheelchair. She can’t remember his name. That’s when Bruce Willis pops into view and reminds her that the man was nicknamed “Mr. Glass.” And that’s where Shyamalan fans went crazy because it’s a reference to Unbreakable. For some, that scene may have changed perception of the film entirely. For others, it may have made an enjoyable enough film even better. However, as I wrote in my review, I think even a hint of the reveal may have prevented any reaction from being pure. I read a blurb which simply mentioned that the scene established that Shyamalan’s films take place in the same cinematic universe. But even that seems like a spoiler because it indicated that there would be a nod to a previous film. Dunn seemingly confirms Price’s theory that if there’s someone like him, whose body is terribly fragile, then his polar opposite — one who’s nearly invulnerable — must exist. As the story develops, Dunn realizes that Price’s theory might actually be true. He’s never gotten sick or suffered any kind of injury. He also has an inherent sense of people intending to hurt others or commit crimes. Through touch, he can even flash back to incidents that have already occurred. And he’s much stronger than he may have realized, because he’s never tested his limits. Price believes that Dunn is unhappy because he knows he’s not fulfilling his purpose of helping people with these abilities. Here’s a spoiler warning for a 16-year-old film. Go to the next paragraph if you don’t want to know how Unbreakable ends. Dunn has finally embraced his talents and the ability they give him to help people. He has become the hero that Price (and Dunn’s young son) believes he was meant to be. But Dunn then discovers the awful truth behind Price’s theory: He orchestrated catastrophic accidents in the hopes of finding someone who escaped unharmed and thus proved that his polar opposite existed. Mr. Glass is the arch-villain of the superhero that Dunn has become. Unfortunately, Shyamalan then makes a major misstep by explaining the rest of the story through title cards, like Animal House. Price is arrested for terrorism and institutionalized in a home for the criminally insane. It was a terrible way to end the film, giving the impression that Shyamalan had no idea how to conclude his story properly. With that final scene in Split, the director is saying that this movie is effectively a sequel or perhaps some kind of spinoff to Unbreakable. While it’s not his best or most popular film, it holds a lot of appeal to fans of superhero comic books and movies. And its ending left open the possibility of a sequel, forwhich fans have been nursing hope over the past 16 years. Shyamalan has now squirted gasoline on that fire, saying in interviews that the Kevin Crumb character was originally intended to be a villain in Unbreakable, but was cut out of the script when the story became too unwieldy and needed to focus on the Dunn-Price dynamic. If audiences respond and Split makes enough money, Shyamalan would like to make a sequel to Unbreakable, presumably with Dunn taking on Crumb. But it was a modest hit, grossing $95 million domestically against a $75 million budget. Including worldwide box office, the film made $151 million, the fourth-most among Shyamalan’s films. These days, however, that would probably be enough to be considered a hit and generate a sequel. Shyamalan is apparently at the point in his career where he’s ready to revisit Unbreakable, perhaps hoping it can restore him to the days where his name was a brand that drew audiences by itself. If it was sold as Shyamalan’s take on a superhero movie, then maybe that would be a draw — even to the people who just want to be creeped out or surprised. But the director might be overestimating his appeal and the popularity of one of his older films if he thinks a sequel to Unbreakable would attract more than cult audiences on its own. Overestimating himself is a mistake Shyamalan has made previously in his career, almost sabotaging the success of a filmmaker who once seemed like he might rule Hollywood. Is he setting himself up to repeat that error?